The Virgin Island Next Generation Network (viNGN) received over $100M in grant funding to deploy a fiber optic network to the islands of St. Thomas, St. Croix, St. John and Water Island, creating a territory-wide middle mile network and the ability to connect community anchor institutions with reliable high-speed Internet services. NEO’s Scope of Work. 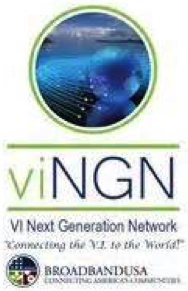 NEO was hired by viNGN for broadband planning and development of the Business and Financial Plan and supporting Work Plan to comply with viNGN’s grant requirements, contract negotiation, and project implementation for the viNGN’s Public Computer Center grant and for their Sustainable Broadband Adoption grant. The Public Computer Center grant allowed for deployment of computer centers in (51) public housing, libraries, schools and community centers. The Sustainable Broadband Adoption grant provided computer literacy training to over 2,000 residents. NEO provided planning and implementation activities for both of these grant programs. In doing so, NEO met with key community stakeholders, public housing and library employees and management to negotiate access to buildings for placement of the computer centers. NEO developed bids and Request for Proposals, assisted in the evaluation criteria and process and provided vendor management services. We developed the training curriculum, hired trainers, developed marketing, outreach and training plans and provided overall program management and grant compliance reporting. We are currently providing Project Management and oversight of the engineering and construction of their completion of their fiber optic network as a subcontractor to AEG. The Result. As much as we get kidded about “working” in the Virgin Islands, we were essentially building networks, establishing computer centers and rolling out a comprehensive training program in a third world country, with very little resources available to us. The grant program was measured on how often the computer centers were used and how many people were trained and in what capacity. In addition to building the fiber network and developing the computer centers and training curriculum, we needed to determine how to get people to go to these computer centers which were located within gang-ridden, public housing authority, dismally-furnished places. The real work was to renovate, paint, furnish and redecorate these public housing computer centers and then establish motivation to get people to come and complete the training program. An entire book could be written about this! The program is a huge success; over 2,000 people have completed advanced IT training and the computer centers are now the hub of many of these communities. The fiber network has been built and this serves as a platform for revitalization and economic development.